may be the future of smoking"
I honestly hope it doesn't come to this, but more and more, I begin to wonder what would be the reality for smokers were tobacco to be outlawed, or more likely and perhaps even worse, were it to become the exclusive regulatory domain of the pharmaceutical industry and the physician's prescription pad. We all know it COULD happen. Most feel it won't, but I'm beginning to wonder. Of course, to make tobacco completely illegal is no doubt highly unlikely since it represents such a huge source of tax revenue. Many state and local governments have come to rely on (have become addicted to if you will) these considerable additions to their coffers. The federal government, a large segment of the legal profession, and of course all those wonderful foundations and other non-profit dodges set up specifically to do battle with big tobacco and smoking in general would suffer a wide range of fiscal discomforts. Tobacco dedicated foundations and non-profits would face certain oblivion, at least, that is until they found another cash cow to milk. So perhaps it is unrealistic to expect tobacco to ever become an illegal substance. On the other hand by making tobacco a "controlled" substance or a prescription only medication, which is what the medical profession and the pharmaceutical industry have probably had in mind all along, the profit motive alone could drive this scenario forward into the realm of reality. The lawyers, of course, would still have their field day and shift their focus increasingly to the drug industry but can you imagine the wonderful commissions that doctors would get for writing tobacco prescriptions. No doubt these little "percs" could even rival the windfall fees that the legal profession has taken in this fight. And big pharmaceuticals, having control over the manufacture and supply of nicotine could certainly find ways to justify increases of their already criminal price-over-cost relationships to be passed on to every smoker in the country. Imagine cigarettes at $5 a stick in a nice little prescription baggie and nicotine supplements to compliment the smoker's dissatisfaction with the 2 or 3 sticks per day they could beg the doctors to prescribe. And, of course, let's not forget the mandatory doctor office visits that will most likely be a necessary part of the prescription renewal process. So we have choices here. We could continue to whine about the possibilities and we should continue to endeavor through the political process to avoid this kind of future, but no course of action is wisely pursued without a coherent backup plan. A backup plan ideally that effectively nullifies the worst of scenarios smokers face. If it turns out we cannot control our representatives, then at least we should control our personal supply. During prohibition people made their own alcohol. Most of what is publicized of that era involve the efforts of organized crime to create a black market for alcohol (or more accurately, to service an already existing one) for the obvious reason of huge profits. But regular folks have been making their own brew and booze for a very long time and today home-brewed beer is a cottage industry. Regular folks can supply their own tobacco as well. Enter the Seedman. This is the only site we've found that really has a serious section dedicated to growing one's own tobacco, including all the seeds, supplies, flavorings and equipment one needs to eventually become a self-sufficient tobacco grower. The Seedman is Jim Johnson, a highly respect purveyor of a large variety of seeds most of which have nothing at all to do with tobacco. Jim's expertise as a horticulturist is recognized and sought after by governments, universities and farmers, amateurs and professionals alike. His website is huge and though only a small percentage of the site is dedicated to tobacco, this small percentage provides a nearly overwhelming amount of information on the subject. We will only briefly share with you what you will find at Seedman.com, which should be more than enough to pique your interest. The bottom line (already?) is that you can successfully grow, cure and shred (cut) tobacco in your back yard with minimal startup expense. The Seedman provides a wide variety (lots) of tobacco seeds as well as growing kits complete with video taped guides to successful tobacco growing. These videos, by A.B. Daly from the UK are entertaining and quickly illustrate the point that even in less than ideal weather conditions as found in the UK, tobacco cultivation is pretty simple. Let me stress here that it does take a little initial patience, something that I have only a minor relationship with. In fact, about two months ago I planted a variety of seeds I got from the Seedman. Typically, I grew impatient waiting for the damn things to germinate and proceeded to dump the un-sprouted seeds and germinating soil mixture straight into a small plot (5'x5'). As stated, I am neither patient nor adept at growing anything save debt. So it is with a great deal of satisfaction that I now have a dozen or so really healthy looking plants. The particular varieties that seemed to survive my grave yard approach to gardening are a wonderful Jasmine tobacco that has big trumpet shaped flowers (smells like Jasmine -yummm), a Chilean hybrid, a similar Orinco leaf (from the Amazon region) and Montecalme Yellow. All of the plants are spectacular and within a month or so I will be ready to harvest. In the next issue, I will further share my experiences with you complete with pictures, but suffice it to say (and I really hate this cliche) if I can grow it, anyone can. Of course we do have a lot of deer in our neck of the woods and they do love to munch on things. I should build a protective barrier around the plants but I love having deer in the yard and hate making them feel unwelcome, so I may pay a price. They've already munched the spectacularly fragrant sweet Jasmine flowers of that particular plant but hopefully, there will be some left to share pictorially with you next time. Obviously the above is very condensed but it truly covers most all of what you need do. Of course, you need to buy a cutting machine for shredding the final compressed leaves into tobacco that you can roll or inject (see diagram at right) and it comes with the parts necessary to compress the tobacco leaves into bricks. You may want to build a small green house (plastic material over a cheap wood frame will work - it doesn't have to be elaborate and it is amazing how few plants you will need to completely supply yourself with tobacco. It will keep the animals away from your plants and provide heat and moisture efficiently year round. Some people use a kiln for drying the leaves faster and more efficiently and Jim Johnson, the Seedman, tells us he is working on plans for such a device that you can easily build at home. A drying shed will do though or under the eaves of a carport if pressed. The leaves should be hung to day at any rate. The flavorings mentioned in the outline above are a vital ingredient to making your final product truly enjoyable and you can get flavors that simulate every kind of cigarette tobacco you can imagine including Marlboro, Virginia style, and most pipe tobaccos, or even flavors like vanilla, strawberry for the flavored cigarette crowd. The Seedman site is full of ideas and methods of flavoring and has all the flavors you can imagine. We tried the Marlboro like flavor and were amazed at the similarity although we preferred the Virginia flu-cured. Now, if all of the above seems like a lot of trouble, remember our original premise. We are talking about a future where no commercial tobacco is available or so expensive and/or regulated, that it is out of the reach of most. Even with all the taxes and tobacco settlement costs that are added today to the price of tubes, injectors, bulk tobacco (literally everything associated with smoking), roll your own smoking remains a huge bargain in taste and value. There is little NEED for anyone to grow their own yet. But like most things requiring skill, if and when the day comes that the tobacco you grow will be all you can get, you should be prepared and it will take some time to master the process. We suggest (as we are doing) to start this as a hobby with, say, at least a five year plan to become proficient at it. You will learn a lot about tobacco in the process. You don't need to run out and buy a farm or spend countless hours on this project. Keep it simple. Start small, take your time and acquire the skills necessary for self-sufficiency over the five years or so. The plants are pretty cool and in some cases dramatically beautiful. 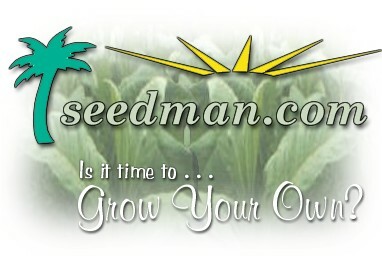 Be sure to check out the Seedman site at www.seedman.com. There are also a lot of great seeds for the veggies you love and nearly everything else you can possibly grow and not go to jail for. If you should decide to begin this experiment, keep us posted on your progress. Send pictures and let us know the good with the bad. If it ever becomes necessary to grow our own, a network of practical information and experiences will be vital. Until next time - Enjoy.